Transocean range of sophisticated marine coatings. Wherever you are in the world the Trans- ocean Dolphin symbol is your sign of the best paint service to the ship and fleet owner and your sign of the finest quality marine coatings. 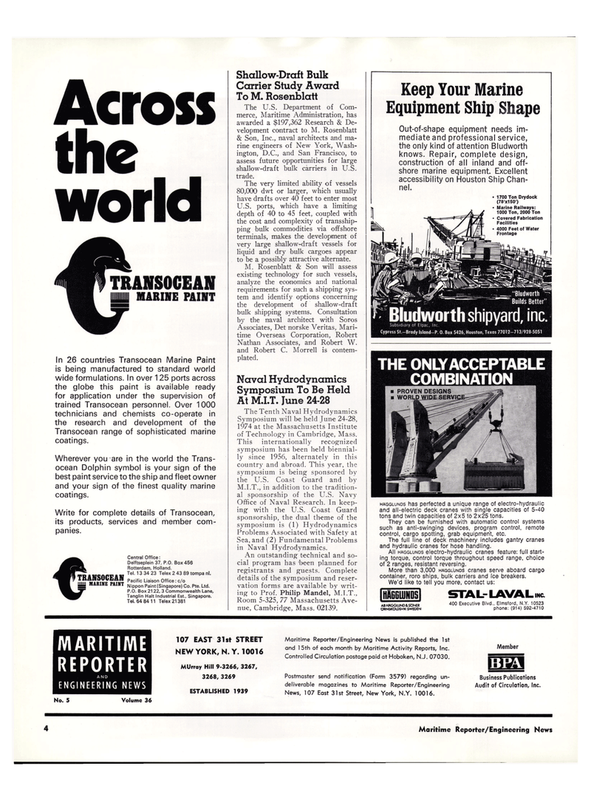 Write for complete details of Transocean, its products, services and member com- panies. ^ITR mi V"
Rotterdam, Holland. TRAHCnrFAN TeL 133423 Telex 2 43 89 tompa nl. iff' MARIMF MIVT PaCifiC LiaiSOn 0,fiCe '' C/° S M4RIKE PA,"T Nippon Paint (Singapore) Co. Pte. Ltd.
Tanglin Halt Industrial Est., Singapore. The U.S. Department of Com- merce, Maritime Administration, has awarded a $197,362 Research & De- velopment contract to M. Rosenblatt & Son, Inc., naval architects and ma- rine engineers of New York, Wash- ington, D.C., and San Francisco, to assess future opportunities for large shallow-draft bulk carriers in U.S. trade. U.S. ports, which have a limiting depth of 40 to 45 feet, coupled with the cost and complexity of transship- ping bulk commodities via offshore terminals, makes the development of very large shallow-draft vessels for liquid and dry bulk cargoes appear to be a possibly attractive alternate. Nathan Associates, and Robert W. and Robert C. Morrell is contem- plated. Symposium will be held June 24-28, 1974 at the Massachusetts Institute of Technology in Cambridge, Mass. Sea, and (2) Fundamental Problems in Naval Hydrodynamics. Room 5-325, 77 Massachusetts Ave- nue, Cambridge, Mass. 02139. HAGGLUNOS has perfected a unique range of electro-hydraulic and all-electric deck cranes with single capacities of 5-40 tons and twin capacities of 2x5 to 2x25 tons. They can be furnished with automatic control systems such as anti-swinging devices, program control, remote control, cargo spotting, grab equipment, etc. The full line of deck machinery includes gantry cranes and hydraulic cranes for hose handling. All HAGGLUNOS electro-hydraulic cranes feature: full start- ing torque, control torque throughout speed range, choice of 2 ranges, resistant reversing. More than 3,000 HAGGLUNOS cranes serve aboard cargo container, roro ships, bulk carriers and ice breakers. Maritime Reporter/Engineering News is published the 1st and 1 5th of each month by Maritime Activity Reports, Inc. Controlled Circulation postage paid at Hoboken, N.J. 07030. News, 107 East 31st Street, New York, N.Y. 10016.